Brooklyn Tabernacle is an evangelical non-denominational megachurch located at 17 Smith Street at the Fulton Mall in downtown Brooklyn, New York City. The senior pastor is Jim Cymbala. The Brooklyn Tabernacle was established in 1847 as the Central Presbyterian Church, using the facilities of the First Presbyterian Church, at the corner of Willoughby Street and Pearl. Their first building was a frame tabernacle on the corner of State and Nevins Streets, beginning April 3, 1853. The first tabernacle was destroyed by fire in 1869. The second Brooklyn Tabernacle was built in 1873 at the corner of Marcy and Jefferson. This tabernacle was destroyed during a thunderstorm in 1889. The third tabernacle, built at the corner of Clinton Avenue and Greene Street seated 6,000 persons and was destroyed by fire in 1894, but was then rebuilt at the same location. In 1966, the church is renamed "Brooklyn Gospel Tabernacle" by the pastor Clair D. Hutchins. By the time Pastor Jim and Carol Cymbala took over the leadership in the autumn of 1971, the congregation had dwindled to 40 people who met in a rundown building on Atlantic Avenue in Brooklyn. 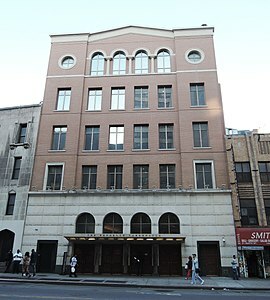 In the 1980s, the Brooklyn Tabernacle purchased the former Carlton Theatre at 292 Flatbush Avenue at 7th Avenue, converting the 1383-seat theatre into a church. After many years of decline, the church was revitalized as a non-denominational congregation, and became well known as the home of the award-winning Brooklyn Tabernacle Choir. In 1984, the church took its current name "Brooklyn Tabernacle". The church remained in this location until 2002 when they moved in the former Loew's Metropolitan Theatre at 17 Smith Street. The sanctuary seats 3,300 people. The church has been noted for its sermons, guests and its six time Grammy Award-winning Brooklyn Tabernacle Choir, which is directed by Carol Cymbala, the wife of the main Pastor, Jim Cymbala. The church has held three two-hour services weekly. In 2017, the church had 10,000 people. The current building was completely redone by Kostow Greenwood Architects and Robert Silman Associates by gutting and renovating the old vaudeville theater for modern worship, and with state-of-the-art acoustics and recording equipment. Two adjacent buildings were converted into offices, classrooms, community service areas, and dining facilities. ^ "The Choir - Discography - The Brooklyn Tabernacle". ^ Archibold, Randal C. (2000-02-28). "Brooklyn Choir Wins Praise by Singing the Lord's Praises". The New York Times. Retrieved 31 May 2011. Wikimedia Commons has media related to Brooklyn Tabernacle.